Fertile soil with excellent drainage. Varies. A few small species of gladiolus can survive winter temperatures to -9C (15F), but large-flowered gladioli should not be considered winter hardy. Topdress with rich compost in early summer, after new growth appears. Zinnia and Dahlia. Tall gladiolus make great plants for the back of a sunny bed. When grown primarily for cutting purposes, gladioli are often grown in garden beds so the corms can easily be lifted and stored through the winter. Gladioli are sold as dormant corms. Cultivate the soil to at least 30cm (12in) deep, and digging in a balanced organic fertiliser and a generously amount of compost. Plant the corms 8cm (4in) deep. Plant gladioli in groups, two weeks apart, to insure a long bloom time. Allow 30cm(12in) between tall gladioli. Small dwarf varieties can be planted 20cm (8in) apart. Tall gladioli often benefit from staking. The open florets often face the direction that offers the brightest sun. The colour range is huge, and includes many bi-colours. Cut gladioli for arrangements when one third of the florets are open. The rest will continue to open indoors. As the flowers fade in the garden, trim them off with scissors or secateurs. In autumn, lift the corms before the first freeze and let them dry in a warm place for two weeks. Trim the cured corms and store in open boxes in a cool place through winter. 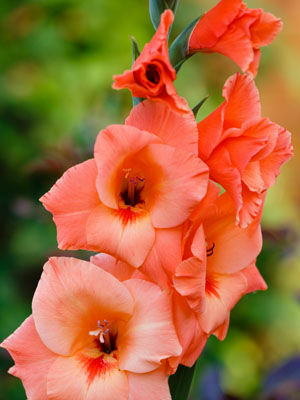 Gladioli have few serious problems with insects and diseases. Discard corms that show signs of rotting, as well as those from stunted plants, which may be infected with any of several viruses.